Nothing says good morning like Kayla’s guitar, playing Road to Ride On by Joshua Radin. After our 9 AM wake up call, each of us laid in our beds for a couple of minutes with this feeling or realization that after five weeks of pre-planning for our trip, we are finally in New Orleans. To rewind a little, we arrived in New Orleans at around midnight and settled into our room at around 2. Seven hours forwards from then, we were awake and dressed, ready to meet Great Papa John for brunch. 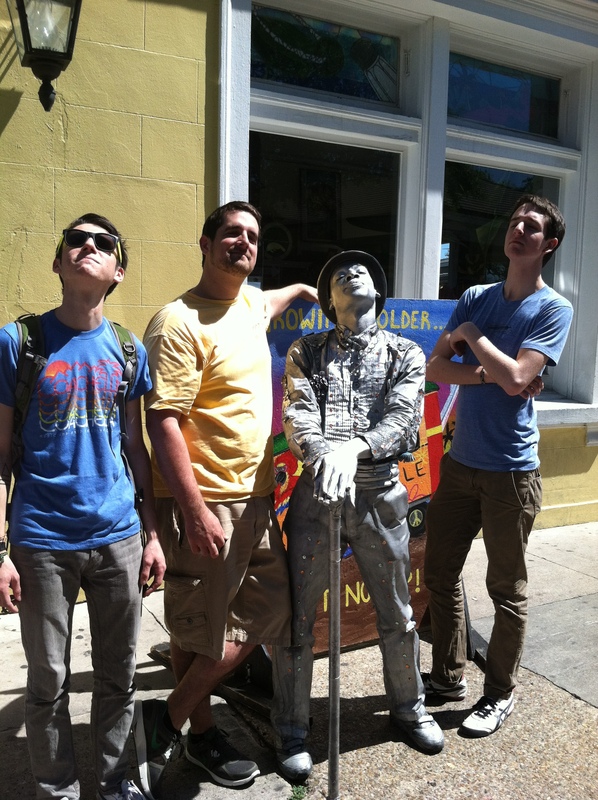 Our initial drive through New Orleans to Jackson Square/Moonwalk was definitely a remarkable moment. Seeing the architecture, amongst the vibrant culture was the moment in which I realized I wasn’t in Oregon anymore. After parking the car, the group walked through the city to Great Papa John’s house and were able to take a peek inside where he lived. From then we went to a restaurant located right near the French market called Magonolia’s Café. We were welcomed by an animated waiter who seemed filled with excitement to us all there. Amongst the different meal selections, most of us went for the omelets, however one hungry soul, Erika, went straight for the Jambalaya (which looked delish!). After a couple of hours of eating we started walking off toward a music festival that we heard was taking place. Needless to say on our way to the festival, there were many unplanned stops along the way. Some of the moments that stood out for me (Marisol) was definitely when a street performer, painted in all silver who stood as stiff as a statue, jumped out and scared Boo Boo (Cassie). Not only was he able to make her jump once, but even after she knew that he was there she continued to let him scare her two more times. This guy was great! We were all able to take group pictures with him and he was definitely a highlight of the day. The silver man, however, was not the only performer that we stopped for. Across the street from the Basilica were a group of guys who were seriously jamming out to some music and started break dancing in front a pretty large audience. I’m pretty sure everyone in our group couldn’t stop watching, and one person in particular, Ted, was so inspired by them that he’s going to start learning how to break-dance and maybe perform at LC – just kidding, but maybe it’ll actually happen in the future, who knows. Another highlight was walking through the St. Louis Basilica, which has such beautiful and detailed architecture. We also saw a street jazz band play, with a few solos coming from a phenomenal clarinet player. Cassie was so impressed by her talent, the way she seemed to sing with her heart and soul through the clarinet, that she bought a CD we listened to in the car on the way out of the city. After leaving there, we continued on our walk to the music festival. When arriving, there was a group of African performers singing and dancing to very high energy rhythms. The rhythm of the drums and the wailing singing vibrated straight through the core and out the dancing feet. Such deep music! Following them was a Latin based group that got most of our group in the middle of the Congo square dancing. Kudus to Erika who danced in public for the first time, in a place other than dark and sweaty dance floors. On the way back we saw one of the most famous jazz houses in the world, courtesy of Papa John’s know-how. By the time we wound our way back everyone was exhausted, but excited. The night before when we arrived we met the group from California who were all intoxicated, and had their spring break the week before us. We quickly realized how our group dynamic was different. We had two workshops ahead of us, one with two young people the other with a woman who worked with us on race. 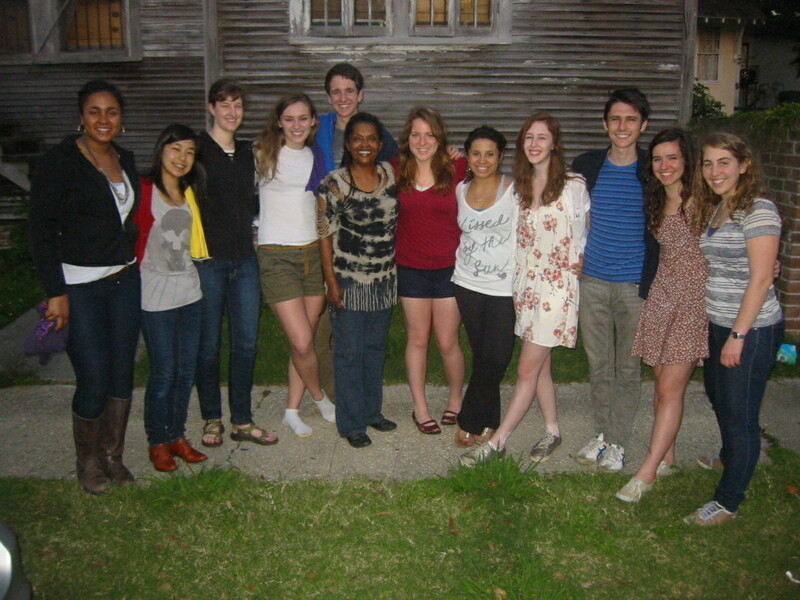 Both groups had come to New Orleans post-Katrina and found themselves unable to leave. After we were famished, and had a wonderful dinner prepared by Mama Amina: red beans and rice, with a crazy bread pudding and rum sauce. After expressing our deep gratitude to Mama Amina we all opened up and talked after dinner, and she quickly became our champion who we greatly admire. After dinner we were so full of energy even though we were exhausted, so we decided to go on a post-dinner walk. We walked all the way to Tulane/Loyola and back. We were finally able to fall asleep exhausted and content. There were so many quirks and funny moments (i.e. Alisons new “friend”) throughout our day in the city, and I am beyond excited to spend the rest of this week with this group of lovely people in New Orleans. The group was greeted in the morning by the song “I am a moose” sung by Erika and Alison. Later, for those that were still dozing, Kayla serenaded the group with a guitar song called “Feel the Tide Turning.” By Mumford and Sons. Mama Amina started putting on the coffee and setting out cereal – breakfast was underway, and while doing this, she also made lunch for us (pesto, turkey, coleslaw sandwiches – SOO GOOD). We began to collect ourselves, and gather into the van around 8:20. Unfortunately, Cassie was not able to join us because she was suffering from an awful stomach flu (or bon food poisoning!!). After a short drive, we arrived at the school, called Martin Behrman Public Charter School in Algiers. This school was predominately black, and grades k-8. Our group would be working with ‘Mr. 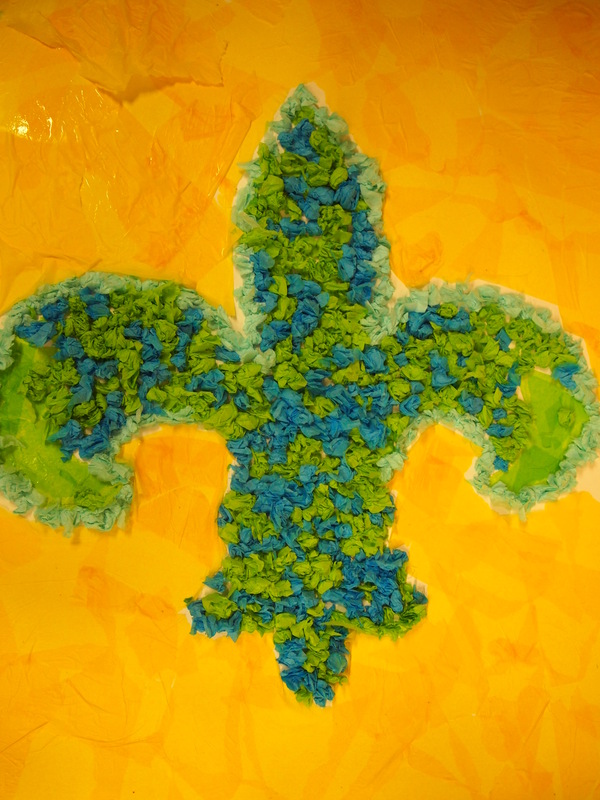 D’ and the Crescent City Art Project in an art room. 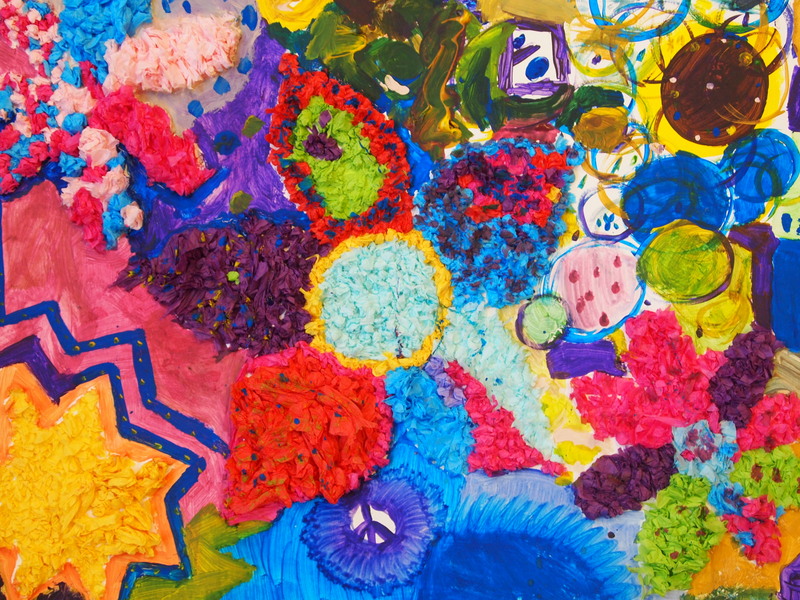 Our first group of students was a lively group of 2nd graders, and we would be creating tissue paper collages. Kayla had a great time with a student named Naaliah, who wanted to be a veterinarian and wanted to treat her kids to the same lifestyle her mother gave to her (which included many adventures!). Mason was able to work with one student who loved pink, and that was about all she could talk about. After a 45 minutes session, the kids reluctantly lined up and left for their next class. Five minutes later, a group of 7th graders timidly walked into the class, unsure of what we were doing there. Mr. D informed them that they would be working with us to continue the art projects. Kayla hung out with a girl named Aneesha who wanted to become a lawyer, wants a son who will become a basketball player, and she was also very good at being awkward. She was willing to be engaged and sincere, while many of the 7th graders were a little ‘too cool’ for the rest of us. Mason had the lovely experience of filling in a heart with little red pieces of paper for a lively girl who decided to create her OWN art project . These students seemed more interested in college, and even began to ask us about what we did at college, and what we were studying. Again, after 45 minutes, the 7th graders lined up and a new class entered – the 4th graders!! Now, these guys were energetic and CRAZY, but responsible. Kayla, Mason, and Sarra had the opportunity to work with a group of girls who were a bunch of divas. Kaliah, Zariah, Kiah, Simodge, and several others amused us with impressions of Bonquiqui (SNL skit) and outrageous nick names and name swapping for us. After a brief moment, Sarra soon swapped names with Zariah, Mason became Mason the Wearwolf or Jason or the Statue of Liberty, Ted became Bob, and Kayla swapped names with Simodge (“I’m going to be Kayla, and you’re going to be Simodge.”). The group dynamic was amazing, and everyone was very engaged and laughing the whole time. After this group left, it was time for lunch. When we entered the cafeteria, heads turned and many students began to stare at us. Mr. D informed us that this was probably the largest group of white people these kids had ever seen in their school. We decided that it would be best to integrate ourselves with the kids, and who sat with us but our favorite 4th graders!! Mason and Ted had an outrageous conversation with two students about favorite foods. It seemed that Mason had all the right answers (strawberries and corn) and Ted had all the wrong answers (blueberries and broccoli). At lunch, Zaria claimed that her favorite musicians were Adele and Prince. Kayla (who is from Minnesota) told Zaria that Prince was originally from Minnesota, to which Zaria said, “You and Me? We gotta switch states!” Lunch only lasted 20 minutes, and then it was back off to the art room! We soon were greeted by a group of 2nd graders, and a new project – making kites. This project required GLITTER (which unsettled both Alison and Mason). Kayla worked with Ja’viayrra and Jaylynn, both of whom loved making their kites. Ja’viayrra wanted to become a hairstylus, and when asked why, she responded, “Because the first time I braided my friends hair, I did it right.” She was awesome, and made a pink and green kite. Meanwhile, Mason was having a mini panic attack about all the glitter, and matters were not made better when the birthday girl in the class decided to throw glitter at him. Next, we were faced with a group of 8th graders. This group dynamic was very different from the rest of the grades. Many group members felt more awkward, and had a hard time approaching the students – and what they should talk about. After a while however, barriers began to soften, and Mason had a conversation with several boys about the benefits of college (and a small school size!). Megumi and Kayla made a zoo of clay animals with a student who was very reserved, but confided in them that she wanted to become an engineer and go to college. Overall, however, the group noticed that this was an incredible experience. After, John picked us up and we drove down Magazine street, stopped to get snowballs, and went for a brief stroll along the busy little street. Mason munched on a Tigers blood snowball, while Kayla enjoyed a Peach daiquiri snowball (they are like snow cones but way better). Later, we joined up with Cassie back at the center for ethical living for a tasty dinner. 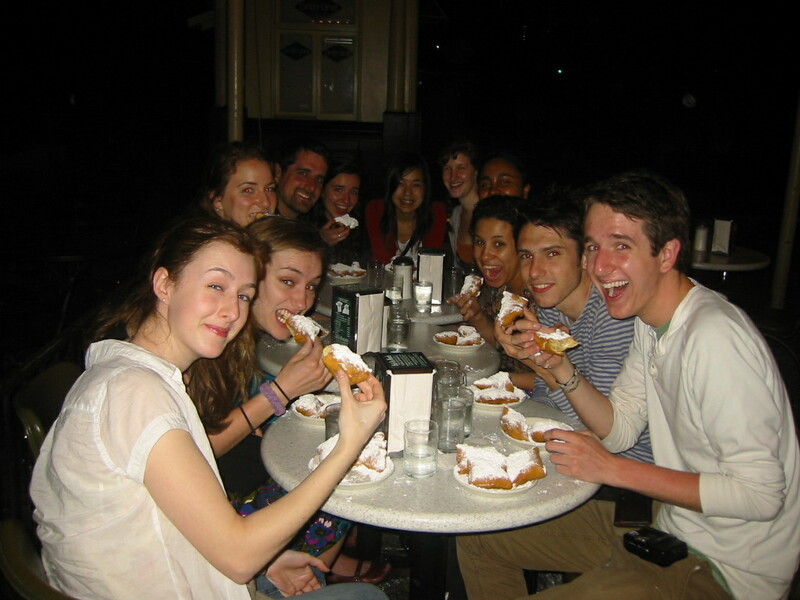 Tonight was Ocra and Jambalaya, sweet potatoes, rice, and coleslaw – followed by the ever wonderful bread pudding. This was all prepared by the sweet Mama Amina. The dinner conversation soon turned to a reflection on the day, which lasted two hours! We started out talking about the day, highs and lows, and then transitioned into discussing what race relations looked like at Lewis & Clark College. Slowly this evolved into a conversation about different experiences with race, white guilt, how hair is culturally important, and about permissive and non-permissive actions between different races. We also shared what it was like to walk into the cafeteria and have so many heads turned. Did we feel alienated, outcast – or welcome and almost flattered? 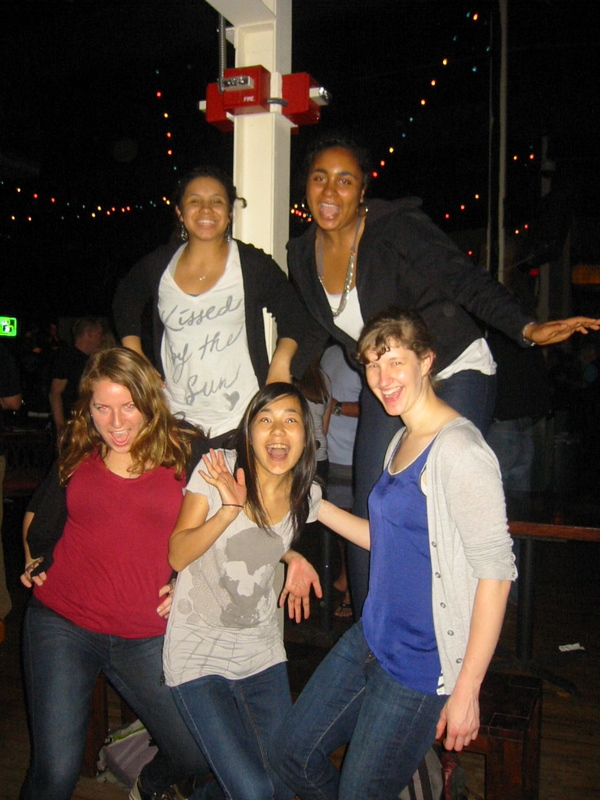 We began to unpack some of insecurities surrounding race, and how this experience affected us. As we did this, we realized how the way the students greeted us was different – they greeted us with excitement, acceptance, and curiosity. How is the sunburn? Getting crispy. Today we woke up at about 6:15 by a beautiful song on the guitar played by Kayla. It is a most pleasant way to start the day! After showering, changing, eating breakfast, and sunscreening, we headed off to New Orleans College Prep in the Cohen Building just around the block from where we are staying. We met LC alum Erin Weldon outside and she took us up to the third floor of the building, to the Prep School. The place is pretty high security, we had to walk through metal detectors on the way in and Erin had to swipe us into the 3rd floor. It was hard to see that the prep school (a charter school) was located only on the third floor and two schools existed so close together, yet with such discrepancies between the education and attitude. It was also hard to learn that the school on the first two floors was being phased out due to poor graduation rates, etc. It turns out that Cohen High School had been featured on a special on the New Orleans education system as an example of the dire state of the system proven by the low graduation and retention rates, not to mention some graduates inability to pass the G.E.D. requirements and the Louisiana State Exams. We spent the first period in the advisory groups (with 4 of us and a small class about college, etc.) talking to students about college and getting to meet them all. Throughout the day we met with students, asked about their interests, and asked if they had any questions for us about our school or college in general. Some highlights include: working on posters for the Social Studies Fair (happening Thursday) with topics like Oppression for Women in Ireland or Poverty and Violence: Which Comes First. It was incredible to see so many students so engaged, so bright, and so receptive to what we had to say and our presence in their classrooms. Many of them were asking us questions, really wanting to get to know us just as we wanted to get to know them; and even if it was only for a day, it was a magical day with students that have drive and goals. Being with them and feeding off their energy was incredibly inspiring and enlightening. They also had a mean dodge ball tournament at lunch that we got to see too! After lunch we spent some time talking with Ms. Greene, a teacher originally from Seattle and a graduate of Whitworth University in Spokane, WA, and learned about her experience in the New Orleans school system and how she made her way into it after Katrina 6 years ago. She was really thrust into the thick of things at a time when the vast majority of the black students were not accustomed to having a white teacher. That said, watching her in class was incredible to see the relationship that existed between her and her students that transcended racial lines in a very powerful way. Ms. Greene was able to share with us some very powerful statistics about violence particularly in the high school years. 1 in 3 African American boys who don’t finish high school are likely to die before age 30. And stories of students being killed over simple and seemingly pointless comments really sank in with us and gave us a new perspective on the school system we had been participating in over the last two days. After lunch with Ms. Greene and Ms. Weldon we headed over to Xavier University of Lousiana, where Dean Tuajuanda Jordan used to work, to participate in a conversation about race and race relations. A historically black college, Xavier provided an incredible experience and contrast to the Lewis & Clark College community. For starters, 98% of the campus population is African American. After meeting Dr. Marion Carroll [CAS Director, Student Academic Success Office], who was largely responsible for coordinating this event, and Dr. Ken Boutte [Associate Dean], we had a Eracism based dialogue responding to the recent events surrounding the death of Trayvon Martin. Needless to say, the conversation was powerful. Several Xavier students brought up the idea that African Americans play a victimized role in situation like this while others presented the absurdity and frustration surrounding white privilege and how wearing a black hoodie can mean your death. Others felt the black community was to blame in the situation because while black people kill other black people all the time, with seemingly no effect, while as soon as a white person kills a black person, it is immediately racism, racial profiling, and the African American community bandwagoning the issue. Many seemed unhappy that this issue was picked up not because it was the loss of a human life, the loss of young man not even out of high school, but because of the color of the skin of the people involved. Though there were many ideas shared and we could write a novel about this conversation alone, some general consensus at the end affirmed that exposure to cultural differences seemed the only way to learn and improve race relations. Connecting with people on basic human level and being willing to learn about someone else and their experiences seems the best and possibly only way to move forward with this issue. We were struck by how much the students of Xavier were grateful that we were willing to listen, willing to learn, and interested in their perspective and experiences. Their appreciation of simply getting attention and talking to people so willing to engage in these subjects shows just how far we still need to go to improve race relations everywhere. Dinner back at CELSJR was delicious! Our new cook Monica made us curried vegetables, mac and cheese, salad, and jasmine rice. Yum! After a quick highs and lows for the day we headed back out to Tulane to meet with students on their campus. We met with Derrick, Lauren, and Cory of the Tulane student organization SOAR (Students Organized Against Racism) and talked to them about their organization, race relations on their campus, and what they are doing to combat racism on an individual and institutional level. They talked about how they put on the “Undoing Racism” workshop (the one we are doing over the weekend) twice a year and are now working to facilitate it four times a year. Overall, the conversation with Tulane was a great way to bring the conversation about race back to the Lewis & Clark College campus because of the similar demographic makeup of the two campuses. It was great to learn from the three of them small ways in which they are impacting and organizing a change on the Tulane campus and provided us with many ideas for ways we can apply the same mentality to our own community. We look forward to learning more about the ideas behind SOAR at the workshop this weekend. Today was an incredible day. Yet again. Wow. So much to process, so much to reflect on. But what and incredible experience to be the minority, or the majority, but either one see what the flip side is like. We’ll let you sleep on that one…. On Wednesday we started by waking up early at 7am to the beautiful sounds of Kayla on the guitar. After a quick breakfast we headed in an almost 2 hour drive to Phoenix, LA. This was a very rural and miniscule town on the southern most point of the state, 40 miles from the city. To emphasize the remoteness of the town, we got completely lost on the way there, despite several sources of directions. Eventually we made our destination at the Zion Travelers Cooperative Center. This was a small organization which focused on rebuilding community after the storm. Headed by reverend Tyronne Edwards, this organization prided itself on its recovery efforts, independent from government assistance. Starting at 11am, we split into 3 groups. One group helped scrub the exterior of the center, the second helped to clean and organize the tool shed which was being used by community members to help repair their houses. The third group helped to paint Reverend Edwards mother’s porch. We were in the first group, who helped clean the outside of the center, which had been covered in an unfortunate green moldy substance. We attacked with scrub brushes, bleach and a power hose to bring the building back to its beautiful white appearance. After scrubbing was done, we helped with the other group with the tool shed. After a quick lunch, I, Megumi, helped paint the porch of the house of Rev.Tyronne’s mother. 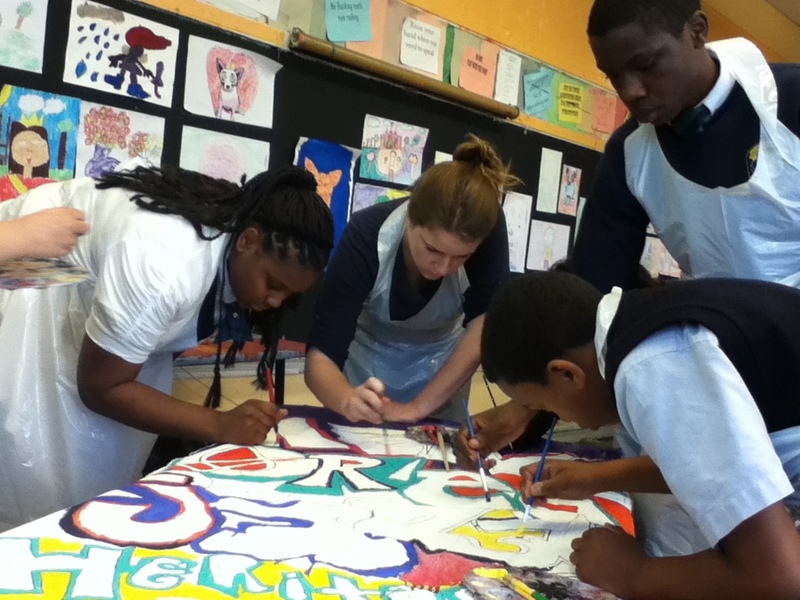 Cassie, Sarra, Emerald and Marisol were also painting. It was a beautiful day to paint, since it was such a sunny and warm day. We first painted the railing with primer, and then Cassie and I started painting the floor of the porch with gray paint. We painted in a logical and mathematical manner; Cassie worked on one side as I went on with the other side. Sarra, Marisol, Emerald, and Emma painted the railing with a white paint. We did a beautiful job! Mother of Rev.Tyronne came out and was satisfied with our work. We had a chat with her a while after we finished. Hello, this is Ted. While Megumi helped to paint the porch, I, along with the rest of the group helped with the remainder of the organizing of the tool shed. A lot of this process involved the cleaning and organizing of many sheets of vinyl siding for the center. This process took up the majority of the time before going meeting up with the rest the group and heading back to our headquarters. 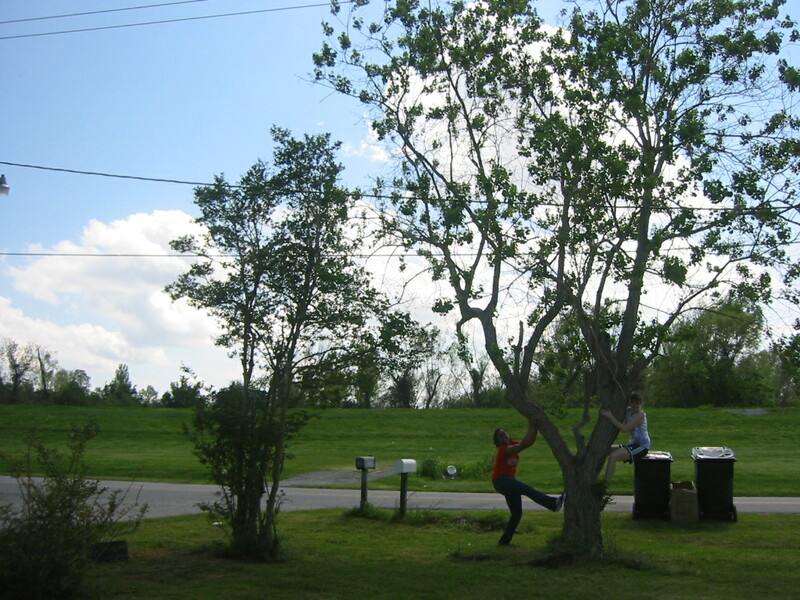 It was refreshing to do simple physical labor because for the past few days, our work was more mentally investing. Both kinds of work are great in their own ways and made up two different types of work in our service trip. We got to the church at around 6pm. We ate a wonderful dinner of spaghetti and sauce and carrot and cucumber salad and garlic bread. After this, we got in the van and headed to the French Quarter where we, accompanied by John’s lovely parents, attended a jazz concert at the world famous Preservation Hall. The music was very traditional New Orleans jazz performed by an immensely talented 6 piece band who went by the name “The Joint Chiefs of Jazz”. We were not alone in our enjoyment of the show, as we were joined by none other than Russel Brand, a famous comedian/actor. This was especially exciting as it was Megumi’s first celebrity sighting!!! The show was amazzzzzing. Afterwards we wandered the quarter a bit longer until we made our way to Café du Monde, where were feasted on the ever so delicious beignets, a New Orleans signature dessert. It was delicious, so delicious that Megumi ate hers in two minutes flat. Ted was close behind her. Thursday was an entirely new adventure, because the group was split into two groups, which volunteered at different organizations. 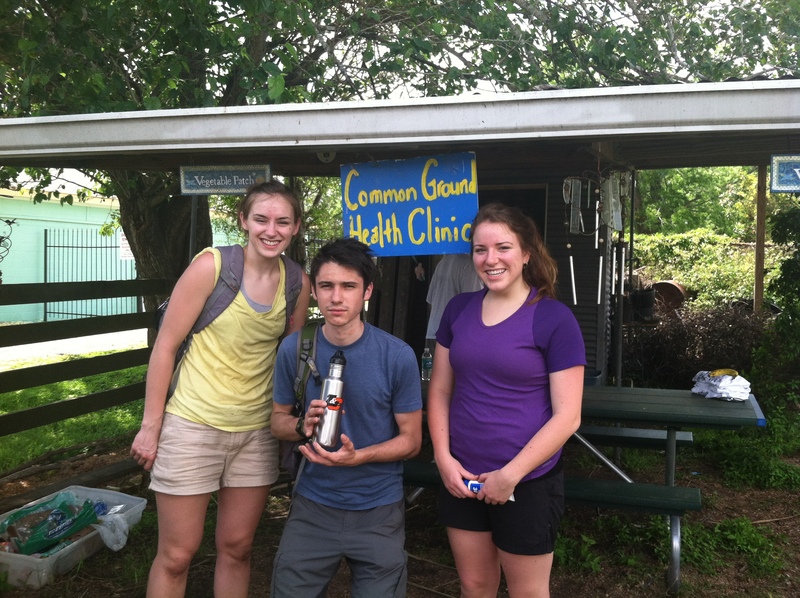 Sarra’s group, which consisted of Ted, Marisol, Emerald, Cassie and John volunteered at the Common Ground Relief Teche Garden and got a tour of the Clinic that is under the Common Ground organization. There they met with Miss Linnetta, who had been a New Orleans resident her entire life. She welcomed them with open arms and a warm smile and plenty of stories from before, during and after Hurricane Katrina. After filling us in about the organizations background and her history within it, she answered questions we had about the area where the garden was and how it had been affected. She told us about the different water levels surrounding the area, the tactics her family had to use to survive and different ways the community came together after the flood water had gone. Some of the tactics her family had to use included using the food packages the government gave them (which contained 3 meals in 1 pack) and how to gain other essentials for her family they had to trek through the stores that had blown off doors to grab food, water and other provisions (mentioning certain feminine provisions that would be necessary for her daughters during that time). When she was explaining the weather and water conditions she mentioned that the levels had not been so high near her neighborhood, but that the wind had made a severe impacts and that EVERYONE got hit with something. Miss Linnetta explained that the Common Ground clinic had developed for the community that was without insurance and not accepted at other offices. The clinic has access to doctors, nurses, therapists, and herbalists that see patients daily . Linnetta was especially interested in the herbalists, but found it weird that they didn’t grow the herbs they used themselves. This gave her the idea to start a garden where the community members could plant their own plants and work toward growing necessary food items in a group atmosphere. We weeded some of the beds and cleared out some old brush and got to talk with another community member who came to garden. Alison’s group consisted of Megumi, Mason, Emma, Kayla, and Erika. We volunteered at Tekrema which is a community center in the Lower 9th Ward. We met Miss Greer who is in charge of the center. She explained to us how the center was purchased just two months before Hurricane Katrina. The initial structure was still the same but it was clear that there had been some severe water damage and we could see how the paint on the walls changed color, which indicated the level of water that stayed in the building after the hurricane. It probably stood at about 8 feet above the ground. Before we started working, Miss Greer told us about the center and how it is maintained by its members and volunteers. Their main goal is to bring the community together through cultural activities and other workshops such as yoga, ballet, and slam poetry. Tekrema was filled with African American cultural objects including paintings, poems, and masks. We spent the morning in the outside space where we planted five trees, improved the compost, and worked on the flower beds. It got very hot early in the day so we thought of some games we could play while shoveling dirt across the yard. We also quickly discovered that the dirt was not very fertile because it was mostly bricks and very hard oyster shells. We were very confused about where all these shells came from and Erika decided that they came from the dragon that ate oysters on the levee, and that they washed into her yard after the hurricane. Once we all met up again, John said, “Is the band back together again? This feels right.” We then drove around the Lower 9th Ward to see the levees and the current state of the community. There were still some abandoned houses, but mostly just empty lots. There are quite a few new houses, including those built by Brad Pitt’s Make It Right foundation. We passed a school that was sending students home with boxes of food from a truck that had Feeding The Hungry written on its side. Then we drove to the Lakeview area across the river to compare the recovery of the different regions. Boy, was it different. Even the levee had beautiful carvings up and down it, whereas the levee in the 9th Ward was grey cement. Due to the fact that this area’s population is mostly white, the recovery efforts have been faster than in the Lower 9th Ward, where the population is mostly black. This made us think more about racial disparities in the rebuilding process and housing in general. One thing we noted in particular was that Lakeview had a grocery store and the Lower 9th did not. We headed back to Xavier University, where we took a self-tour around campus. We didn’t get a chance to talk to too many students, but walked through their student center, a dorm and through the chapel building. All the chairs were purple in the Chapel, that is many peoples’ favorite color on this trip. We came back to our wonderful abode where we had our last dinner with Mamma Amina and Miss Monica. It was a wonderful collection of left-over and new food. We then had our nightly reflection conversation, which started fairly seriously with thoughts about the day and ended in pure laughter about the information we all took in today (or didn’t) and for our separation anxieties. Alison and Sarra then talked about what the next two days would entail and no one could believe there were just two days remaining. After a late night last night, all of us will be hitting the sack early this evening. We would like to end with this quote that is in the kitchen of the center we are staying at, which we hope to embody during this trip and in our lives. We woke up to the sweet smell of eggs that Kayla cooked for us, which we added to our extra supply of beans and rice from the dinner the night before. We split into our groups from the previous day, heading off to Tekrema and the International School of New Orleans. Group “Oystols” headed off to the International School with Mama Jaymilah. We met some of the administrators at the school including Mr. Mo, who is a retired Trinidadian who works at the school because of his passion for the children who study there. He is also a great cook. The Oystols then went upstairs and got directions from the cleaning staff. We cleaned one whole floor of classrooms and offices by sweeping and mopping. The school seemed pretty impressive in terms of its academics, and had an I.B. program along with a connection to Bard College’s Early College system. There were tons of projects and posters on the wall that discussed things like “existentialism” and characters from A Street Car Named Desire. We blasted the music as we swept and mopped until it was time to go to lunch. It turned out that Mr. Mo has spent a whole day preparing this yellow chicken curry for our lunch, and has also provided a cake and an assortment of vegetables and fruits. We ate the delicious lunch as we listened to Mama Jaymilah talk about her kids and grandkids, JazzFest, Katrina, and the importance of New Orleans trees. She mentioned one of her sons named Abdul who had the talent of a professional drummer when he was only five years old. Jaymilah had tried to get him into the band at his elementary school, but they wouldn’t let him because he was too young. He finally got to just sit in on the band class and one day he showed some of the kids how to play a set and the band teacher finally recognized his talent. That year, during Mardi Gras, he played in the parade at just six years of age. He was too small to hold the drums so a boy had a to hang them off his back while he played them during the march. We also mentioned we wanted to eat crawfish while we were in the city, and she began to give us a thorough introduction to the subject. First off, she told us we shouldn’t go to restaurants because they charge too much for their crawfish and then she proceeded to show us the best techniques on ripping the “mudbugs” apart. After working a few more hours the rest of our group returned and Mama Jaymilha showed up with four pounds of spicy mudbugs! She also brought her grandson Tevis who was hilarious and very friendly (especially with Marisol) and showed us around more of the school (which he attended). When we left, all the cleaning staff thanked us profusely and Mama Jemilah and Mr. Mo both said we now had family in New Orleans that we were welcome to visit anytime. Mrs. Grear welcomed us to the Tekrema cultural center and relayed similar stories of Katrina that the group relayed to us yesterday. She expressed being overwhelmed with the upcoming “soul-speak, afro-beat and youth slam bounce dance party,” so our mission for the day was to relieve her stress. We organized into smaller groups and divided and conquered the tasks at hand. The Tekrema Center for Arts and Culture was an overwhelming building, exotic and rustic, and simultaneously beaten down and resilient. The waterline 10 feet above the ground on the first floor was the elephant in the room. Life has been hard in the lower ninth ward, and the residents, such as Mrs. Grear, are a living symbol of resilience. As Mrs Grear described what needed to be done, the team divided into the following jobs: Farmer Ted filled holes in the backyard with dirt and then helped Sarra, the amateur horticulturalist of the group, plant a few trees and create a succulent garden. You should have seen the final product. Mrs. Grear was so moved! Emerald the Great, volunteered to water the crops in the planter boxes. Soon enough she headed inside, to the second floor where she assisted Cassie clean and organize the upstairs supply room. Previously, Cassie (and John) helped arrange the downstairs rooms for the party. John spent the morning floating to make sure everyone felt they had enough support. He eventually landed with Cassie arranging the house for the party, and finished the day helping Marisol with the kitchen. This was another amazing sight. Marisol spearheaded a tremendous job transforming the very cluttered kitchen space into a working kitchen. Again, Mrs. Grear was proud. Lunch was roughly the same as ever. The highlight of lunch was certainly the creation of John’s infamous “Driver’s Cap.” As soon as he put it on, he said, “This feels right.” So true. Who knew a paper bag would double so naturally as a driving cap? John also talked about how much he loved Justin Timberlake. Then he sang a little of Sexyback. It was a good lunch. We worked until about 2 o’clock. Everyone wrapped up at the same time, and we were able to give Mrs. Grear a tour of the completed the projects. I wish I took a picture of everyone’s faces, especially Mrs. Grear’s. There was an unbelievable amount of joy and camaraderie in the air. At one point, she looked at John and said, “Are you a preacher?” John took it as a high compliment to our group. We had truly fulfilled our goal of overwhelming Mrs. Grear with our progress. She was genuinely overcome with joy and wished us well on the rest of our trip. She seemed like she gained her footing again and felt prepared for the weekend events. We were so pumped leaving Tekrema. We made a clear difference in someone’s life and we were headed to get our friends at the International School! John dawned the Driver’s Cap and it was decided that while John was driving he would assume the alias, “Driver John.” His tag line is “I’m John, I’m the driver, and I don’t give a $u@*! This line just seemed so fitting for one of the themes of the week: rejecting preconceived judgments. As we located the school, John got caught in an all too frequent occurrence. He couldn’t go left because of a one-way street. It was ridiculous! New Orleans is littered with one-way streets and he often had to make a series of left turns to get where he needed to go (sometimes he made them twiceJ). On one such occasion, Cassie decided to hop out of the van and race us around the block to the parking lot. The people of that area of New Orleans thought we were crazy. Between Cassie doing stretches and lunges on the sidewalk, and John wearing a paper bag on his head, we were quite the sight. When we walked in to the International School, the energy of our friends was very high. They spent the day helping the cleaning staff do a major cleaning, while the school was out on spring break. 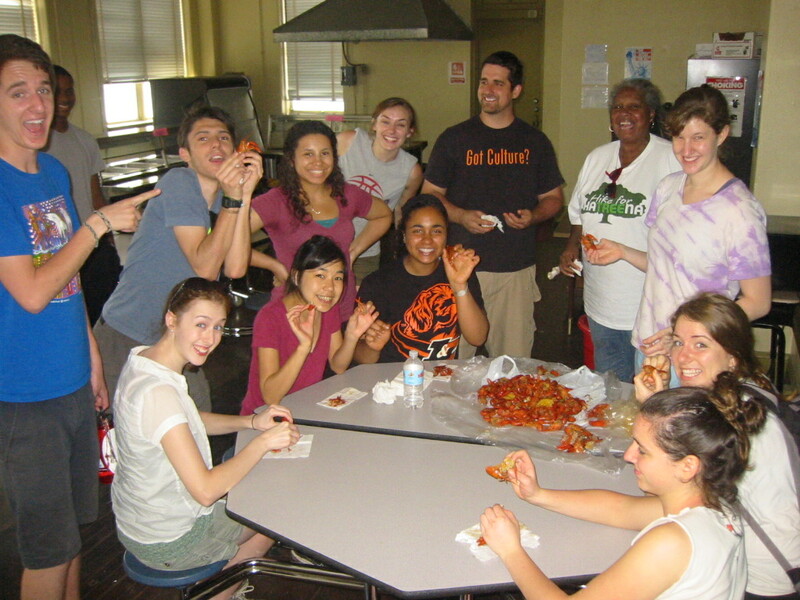 They were finished with the cleaning and were preparing for a crawfish feast. It was the group’s first experience with this local ritual. We tore through four pounds of crawfish in no time. Smiles were common place, as Miss Jaymilah, Mr. Mo and Tevis welcomed us into the community. It was evident that they appreciated our time and energy as much as we appreciated theirs. Miss Jamilah was so hospitable, that she escorted us to a local favorite, C&A Seafood Shop, for dinner. Many of us ordered Po-boys and got to feast on another New Orleans specialty. We ordered our food to go and headed to UTNO for the beginning of the Undoing Racism workshop with the People’s Institute. We gathered as a group for the workshop and did basic introductions. One of the main facilitators, Ronald Chism, had just flown in from New York and was exhausted. We ended rather suddenly, several hours before we anticipated being through. As Alison and Sarra snuck away to by the group ice cream sundae fixins, Derrick (from Tulane) said he would hang out with us and show us some of New Orleans if we wanted. We all went back to our Unitarian home and had ice cream. Our conversations with Derrick easily drifted for hours. This time was no different. We compared stories from our respective Universities. Simultaneously exposing some of LC’s shortcomings around diversity and inclusion, but also realizing many wonderful elements in comparison to Xavier and Tulane. Race, Politics, History, Organizing, Change, and Struggle were common themes of our time with Derrick. 3 hours later, we realized we were tired and that there would be no more touring this day. John took Derrick back home, while the group settled into bed. We were told to draw 4 straight lines that would connect all the dots. No one but those who had seen the exercise before could complete the task, which sparked discussion about “thinking outside of the box” both literally and figuratively. The sides of the box represent real concepts such as money, time, resources, denial, policies, confidence, representation, rules, and tradition. Renee made us think of Jack in the Box and how he can never get out of the box alone because just as the lid of the Jack in the Box can be slammed down again, so can these factors keep you limited to the status quo. Being able to challenge the status quo is a collective process of educating and helping each other. Renee then moved on to talk about how before you empower people, you need to know how they are disempowered. She discussed the importance of always using a power analysis (instead of a needs-based analysis) in our respective organizations. We also talked about code words such as “minority” and “at risk” that can reinforce systems of power. We then talked about various institutions and systems and brainstormed as a group how they (examples include education system and non-profit system) can be a foot of oppression. It was interesting to see how people perceive the roles that race and privilege play in these systems in such different ways. One of the main take-aways from this activity was that it is impossible to address any one system alone since they are all interconnected. And in order to make progress on this issue, and any issue, we have to begin by asking the question: why? 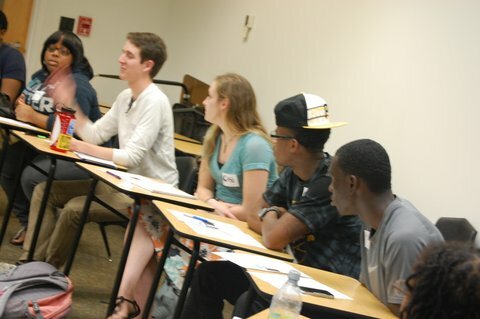 The workshop then began to focus more specifically on race. We first tried to define racism, which proved to be a nearly impossible tasks. It was interesting to see how many definitions people came up with and how different each of them was. Ron and Reverend Tyronne (the two facilitators at this point) shared the working definition used by the People’s Institute: racism = race prejudice + power. We then discussed the origins of racial categories, some history surrounding race (including the fact that the U.S. was the first country to legalize concepts of race by including it in the constitution), and concepts of power and privilege. After extensive conversations, some frustrations and disagreements were expressed, but mostly during the breaks. Most of us agreed that the vibe of the day was strange. It seemed as though when the atmosphere became tense or if the facilitators had just presented the group with an intense claim, they would call a break. Overall, we were somewhat disappointed by the lack of opportunity for discussion, which in the end, seemed to be part of their goal (which many of us took to be telling people about their opinions and definitions). We left the workshop with much to think about with regards to racism and our personal reactions to the information shared. We came back to the center to regroup briefly before Miss Amina arrived with a trunk full of tye-dye t-shirts that she had made! It was so nice to see Miss Amina one last time before we left town, and to take a piece of her with us back to Oregon. After Miss Amina’s “first group hug” and bittersweet goodbyes, we headed out to dinner for our last New Orleans dinner. The restaurant came at the recommendation of John, who said it’s also a favorite of his older brother and Julia Roberts and Sandra Bullock (but we know John liked it first). Dinner was great and as always, New Orleanians are so proud to talk about their city and crawfish. We had a great time talking with our waitress Crystal as we consumed massive amounts of mud-bugs and red beans and rice (though they insist that a small child could eat as much crawfish as Sarra and Erika had to share with the entire table). With many people still processing and reflecting on the workshop, we found a spot in Audubon Park (a lovely meditation gazebo) and took some time to reflect on and debrief our experiences. With so much said, and so much processing still to do, it is hard to capture this conversation in a blog. What we can say though, is that this moment showed just how incredible this trip had been. It’s hard to recall a time when I have felt more comfortable with a group of people both out of respect for their opinions but also the power of a shared experience. One thing we can all agree on is that we can never see Lewis & Clark in quite the same way, and our relationships with each other had definitely grown for the better. We just couldn’t waste our last night in New Orleans sleeping, so we headed out for an adventure at the Rock ‘n’ Bowl (at the suggestion of Campus Living Director Kelly Hoover)! With a live band playing in the background we bowled the night away using our plethora of newly acquired nicknames as our bowling alter egos (including but not limited to Tracy, Big Legs Washington, Emrizzle, MegumiBear, Drumming John (BAM), and Bobar). At around 1:30am we headed back to the Center, cleaned up our shared room, packed some snacks for the journey home, and headed back to the airport. It is a truly surreal experience going “home” and realizing that this place has come to hold such a special place in our hearts in such a short time. We cannot seem to find the words to adequately express our overwhelming pride in our participants and the incredible bravery, respect, and understanding demonstrated over the past week. Your willingness to participate in this whirlwind adventure and commit to the vision in a way the two of us leaders could have only dreamed of is something we will always be grateful for and look back on with the utmost happiness. Louis Armstrong once asked if we “know what it means, to miss New Orleans,” and I think it’s safe to say that yes, yes we now know. Everything YOU Need to Know About Spring into Action! What is Spring into Action? 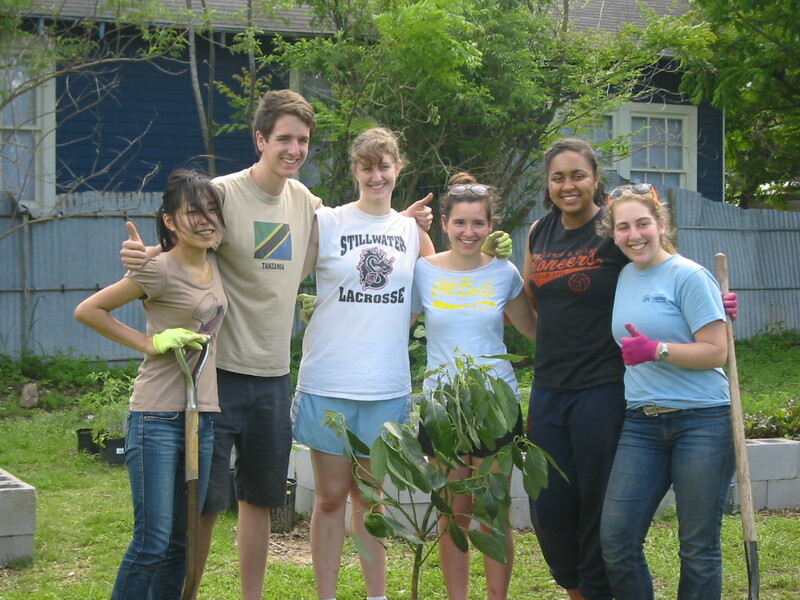 Spring into Action is a community service event for all members of the L&C community. It’s meant to strengthen the connections that students, staff, faculty, alumni, and families feel to the school, while also uniting L&C’s undergraduate, graduate, and law schools. Students on a leadership retreat came up with the idea for Spring into Action because they felt that there was a disconnect between the various parts of the L&C community. They wanted to bring L&C together while also positively connecting with the greater Portland community. One student took this concept and made it a reality. This year is the third annual Spring into Action! On April 21st from 10 a.m. to 4 p.m.
What will happen on April 21st? All participants gather together in the morning for breakfast, then split off into service site groups and depart. After two hours of community service, everyone reunites for lunch and reflection. This time gives participants the opportunity to learn about others’ experiences and meet people outside of their volunteer group. There will be a series of activities to facilitate personal engagement and this is the perfect time to strike up a conversation with a stranger! What are the volunteer projects? There are 14 sites throughout Portland to choose from this year! The project options range from gardening to organizing to helping care for ferrets. How excited are the project leaders? The project leaders who will be at each site said they’re “violently-mosh-pit,” “riding-a-T-Rex-into-the-sunset,” and “just-got-my-Hogwarts-letter” excited for Spring into Action! I’m embarking-on-a-world-tour-on-a-dragon excited. How excited are you? All of the sites are set, the buses were ordered, T-shirts are being printed, and everything is coming together. Our Portland community partners are thrilled to have our help. Almost 150 people have registered thus far! Our goal is to have 300 participants, and we can’t do that without you! 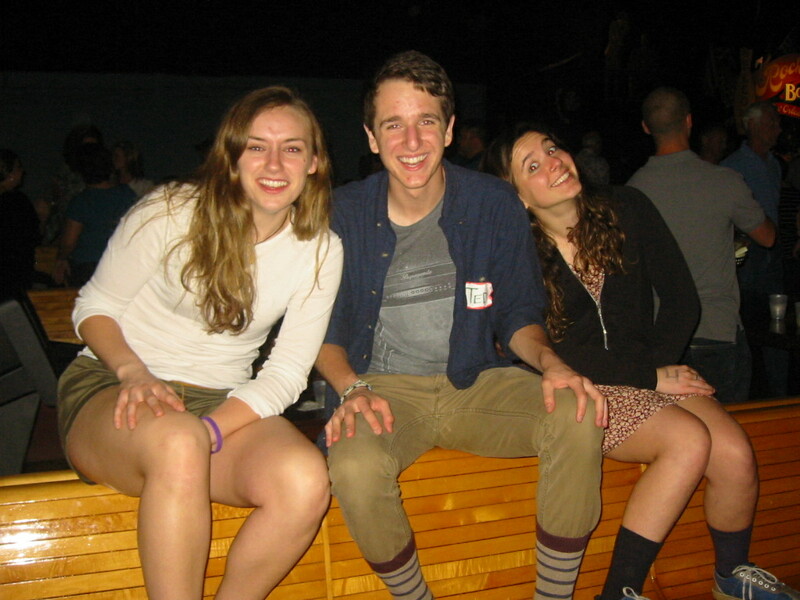 Brynn House is a sophomore at Lewis & Clark, majoring in German Studies and Rhetoric and Media Studies. She is the Marketing Lead for Spring into Action and enjoys baking cinnamon rolls. The folks in 3CE recently caught up with Eli Fabens to hear more about his experiences working at Oreninc, an independent financial services provider for companies, institutions, and investors in the junior commodities space. Eli, originally from Ithaca, New York, graduated from Lewis & Clark in May 2011 with a degree in Economics. Q: What is your job title? Can you tell us a bit about your day-to-day experience? Read the rest of Eli’s story HERE. You probably already know that you can visit the Center for Career and Community Engagement (3CE) for resume or job searching help. However, you should know that reasons to visit us in Albany run way deeper than that. This is currently my first year at 3CE and I want to share with you my experience with the 3CE and why YOU should take advantage of all of the resources they have have to offer. 1. You’ll discover something new about yourself. If you’re anything like me, a confused college student, you probably still aren’t aware of your own strengths and interests. Luckily for you, 3CE offers psychological inventories to access how you perceive the world and make decisions. You can set up an appointment with any of our career counselors to take the Myers-Briggs Type Indicator (MBTI) which is a questionnaire that reveals your “personality type” and how to apply that those finding in your every day life. 3CE also offers the Strong Interest Inventory assessment which is to give insight into a person’s interests, and give them an idea of appropriate career choices for themselves. 2. Develop the skills necessary for career success. The career counselors in 3CE want you to succeed and will provide you with the resources on doing just that. You can make an appointment to get help refining your resume, learn job interview techniques, become aware of job search engines, learn how to network, find internships, and learn how to engage in the community to get the best out of your college experience. 3CE advocates for learning through doing and they make sure to provide you with the necessary skills not only through one-on-one sessions, but events. Just recently there was an event called “Etiquette on the Rocks” where students were able to learn first hand how to network and socialize with etiquette experts. This office is dedicated to making sure students are given a variety of opportunities to volunteer in and out of Portland. 3CE not only offers one-time volunteer opportunities, but also on-going service, overnight service, and international service. 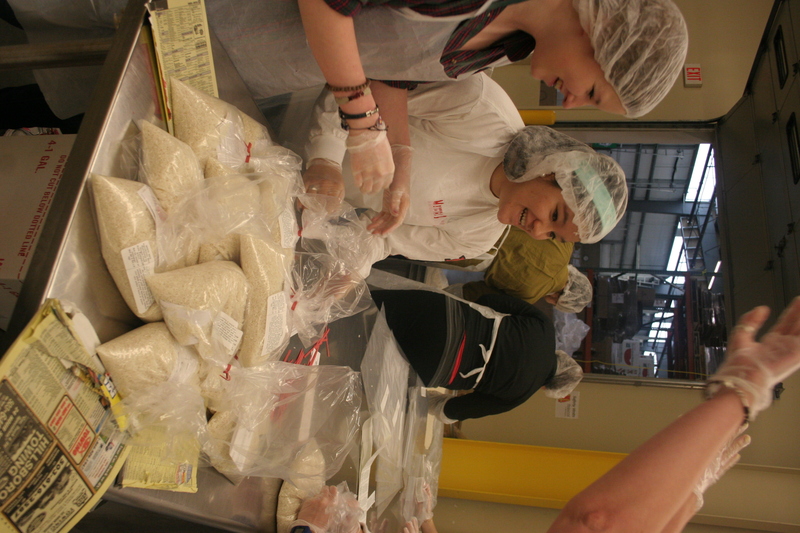 Volunteer opportunities range from hunger to health-care and literacy. I personally have been able to participate on various one-time service projects from MLK Day of Service to Blood Drives. 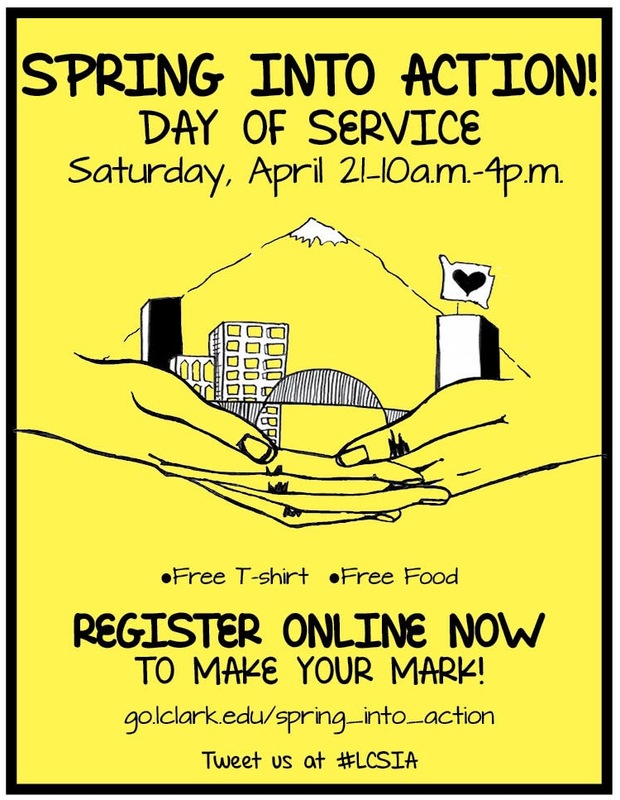 Other one-time service projects that I know of are Spring into Action, and Saturday in Service. If you’re someone who needs to volunteer more consistently some of the on-going projects 3CE offers are Open Meadow, Operation Night-watch, and S.M.A.R.T. I have yet to participate on any of the on going project, however I can say that I will be participating on an Over-Night Service trip to New Orleans through a program called Alternative Spring Break. 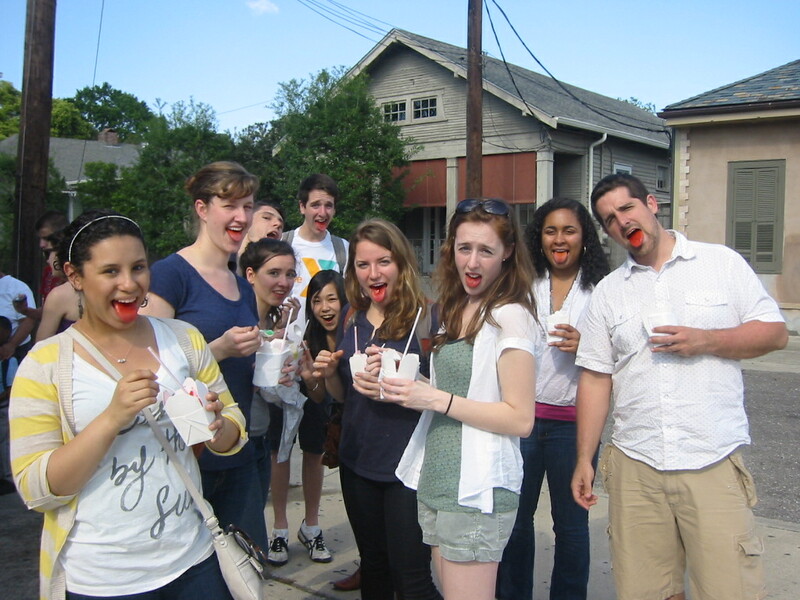 3CE also offers an Alternative Fall Break as well as an Urban/Sustainable Action over-night trip. So if you feel like you haven’t been fulfilling your civic duty, 3CE is more than willing to provide you with opportunities to get involved with the community! As a first year student at Lewis & Clark, and recently hired employee at 3CE, these are the reasons that I was able to come up with as to why YOU really need to check out our office! The people here are amazing, and want to assist you in finding direction and purpose for your life. Not only do you work closely with career counselors, but you can also receive guidance from your fellow peers who are trained on in resume building to graduate school applications. So don’t be shy, we’re all really nice people, and come visit 3CE to start using the valuable services we have to offer. Marisol Jenkins is a first-year Student Assistant in the Center for Career and Community Engagement. She is originally from San Diego, California. She plans to major in Sociology/Anthropology and is a member of pep band and Campus Activities Board. The folks in 3CE caught up with Carolyn Worthge, over winter break to hear more about her experience working with the ONE Campaign as a Faiths Act Fellow with the Tony Blair Faith Foundation. Carolyn, originally from San Mateo, California, graduated from Lewis & Clark in May 2011 with a degree in Sociology/Anthropology and a minor in Music. 3CE: Tell us a little bit about your experience as a Faiths Act Fellow with the Tony Blair Faith Foundation. Read Carolyn’s whole story here! 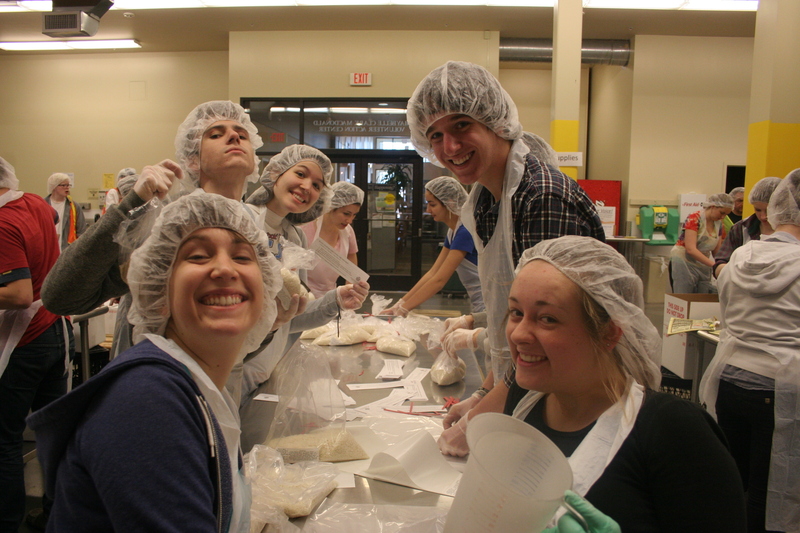 LC students looking stylish in their hairnets! On one of the most beautiful days that Portland has seen during our rainy winter, sixty-six Lewis & Clark students loaded onto a bus and headed out to volunteer at the Oregon Food Bank. We gathered in front of Templeton this past Saturday, February 4th. I had everyone sign in and then we packed onto a school bus. I was the last one on. Our bodies had grown just a bit since those elementary and middle school days when three of us could fit on one bus seat. I hadn’t realized what sixty-six grown adults looked like crowded onto a school bus. There were friends sitting on laps of others, people squeezed into the aisles. I was astonished that so many people had showed up on a day when the sun’s glorious rays called our names. After the bus ride, we stepped off the bus and into the halls of one of the biggest non-profit organizations in the state of Oregon. In the last year, volunteers contributed 93,000 hours to the Oregon Food Bank, which is the equivalent of 45 full-time employees. Volunteers are essential to the functioning of any non-profit, as it saves them time, resources, and promotes community involvement. Excitement over packing 100 bags in record time! We spent two hours packaging rice into plastic bags that included bilingual instructions on how to cook the rice. These bags would then go into emergency food boxes for families or individuals in need. Overall, we packed an incredible amount of rice, and I had an excellent time meeting new people. I witnessed two teams who were working side-by-side competing for how fast they could fill 100 bags. I don’t know who won, but the excitement and enthusiasm was contagious. Thanks to everyone who came out this past Saturday for making it such a successful day! Look out for the next Saturday in Service. We are going to Zenger Farm on March 10th from 1:00 to 3:30. I look forward to another day of new connections and engagement off campus! Welcome to our new series highlighting recent graduates who are surviving (and even thriving!) out in the “real world.” Starting in January 2012, 3CE will periodically highlight recent grads who have found a fulfilling job or are enrolled in an engaging graduate study program. Do you know a recent graduate who has landed a job they love or has been accepted into their dream graduate program? Perhaps you are a recent grad with a story to share. We want to hear about it! Email kdomann@lclark.edu for more information on being a featured recent graduate on the 3CE website. 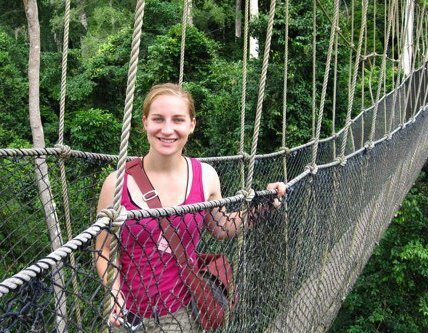 Meet Leah Scott-Zechlin, class of 2011. Leah was recently hired as a German Merchant Risk Investigation Specialist with Amazon.com in Seattle, Washington. Leah graduated from Lewis & Clark in May with a degree in Economics. Q. Have you started your new job? How is it going so far? Leah: I just finished my first month as an Investigator…there is major information overload and every investigation I do seems overwhelming, but it is satisfying to complete them, especially if I wind up finding a sneaky fraudster. I mostly had experience with small non-profits, so it’s definitely a change to work at a large company. There are very cool benefits (working in a beautiful spot in downtown Seattle, discounts on services across Seattle, free public transit pass, ergonomic evaluation for my workspace, )……..
Read her whole story here!